Fred & Eric love nothing more than collaborating, which is why every month we change our logo banner to showcase a new ampersand we’ve been sent. If you’re a fellow lover of this curly form, please send us an ampersand. It could be an illustration, animation, 3D or even made from spaghetti! F&E will post your design on the blog along with a little something about yourself. If you’re short of inspiration, click back through the pages of our blog to see past submissions. Today’s ampersand comes from London based photographer, Andrew Meredith. Although the characters aren’t quite to brand… we are assured by Andrew he’s not trying to get rid of Eric. Budding animation and illustration student, Mateusz Napieralski has this just delivered this handmade ampersand to our inbox, giving Fred & Eric an insight into Mateusz’s characterful and crazy world of illustration and we love it! The very talented Katie Wharton has followed up her ampersand book with a beautiful embroidered cushion. Going a step further and creating Fred & Eric’s entire logo by hand! Katie’s creation is making F & E want to curl up with a cup of tea under their desks as summer draws to a close. Now where did we put those hobnobs…. This chunky ampersand was not strictly handmade especially for Fred & Eric… but it was bought especially for them. Which is equally appreciated! Given to us by one of Fred & Eric’s surrogate mums, Christine Pigram - this wooden beauty has already firmly bedded down as a valued addition to the collection here in the studio. No… it’s not Fred or Eric’s birthday, but they still love presents! Especially ampersand shaped ones courtesy of Paul Campbell. Eagle eyed visitors to the blog may recognise its form underneath that lovely wrapping, as Paul’s previously posted concrete ampersand. Which inspired us to reprise it for September’s banner. Proving ampersands can be found in unlikely locations, Helen Foers found this tiny form while painting her walls. The only good thing to come of a brush with shedding bristles! Fred & Eric are happy it made Helen think of them. Catch up with Helen and her amazing world of handmade at her Storeyshop Store on Etsy and follow her on Twitter @storeyshop. What better way to mark the first day of August, than with a brilliant new ampersand creation by Katie Wharton. We are assured she fully studied her Latin text book before cutting it up in her homage to the ampersand’s humble origins. Katie’s design was inspired by tracing the history of this much loved character to the first century AD, where it was originally a ligature of the letters e and t (‘et’ being Latin for 'and’ if you slept through your Latin lessons). The finished product is a result of carving through the book using a mixture of machinery and hand carving, alongside a lot of patience and dedication. This mutual love for the ampersand hasn’t gone unappreciated, as it is now sitting in the top spot of Fred & Eric’s book shelf. Thanks Katie! Katie is currently studying at Nottingham Trent University. Follow Katie on Tumblr here. 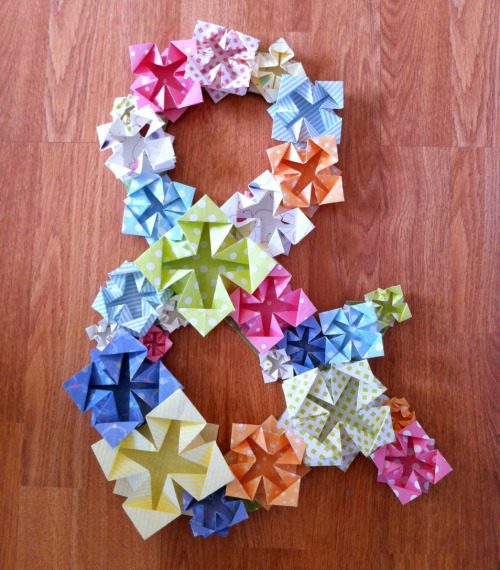 Thea Morris has constructed our very first origami ampersand! Fred & Eric have great appreciation of the patience that has gone into this design, after spending the week making paper creations of their own. We are pleased to welcome Thea’s Ampersand into the fold!